I happened to be at the bulls eye logo place a few days ago, and wandered into the aisle displaying this new section. Indeed, it included supplies for arts, crafts, jewelry making, sewing, knitting, embroidery, pottery, wood, and even fabric bundles. At the time, everything was 20 percent off as a limited promotion. Right off the bat, I noticed both good and bad. 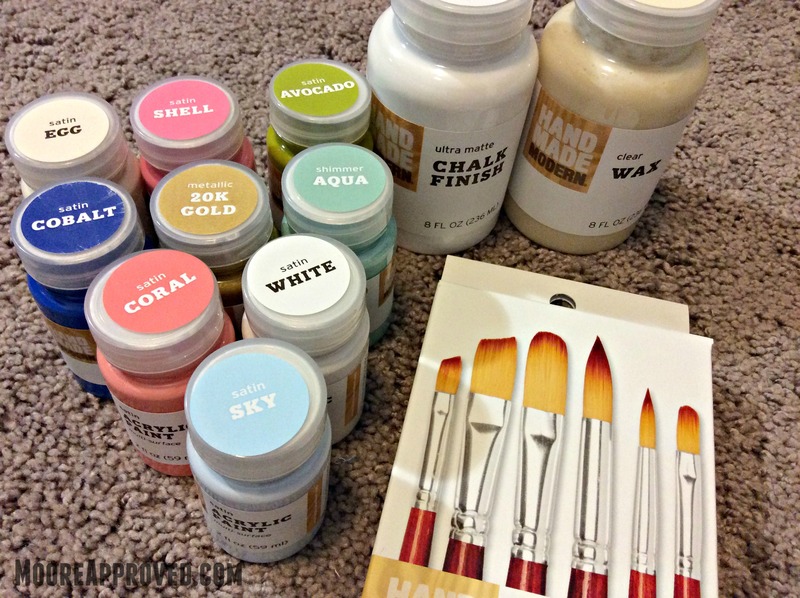 Some of the items seemed like a great value – acrylic paints on sale for under $2, chalk paint/wax for $7.99. ribbon & trim sets at $7.99 for eight. The fabric did not appear to be high quality, not even up to par with Jo-Ann’s (which is saying A LOT). Along with paint and glitter, you can also buy wooden and porcelain items to paint. The unfinished wood items seemed a little pricey to me. I mean come on – a crate on sale for $11.19? Sure, it might be a similar price at Hobby Lobby, but there I can whip out a 40 percent off any regular price item coupon. 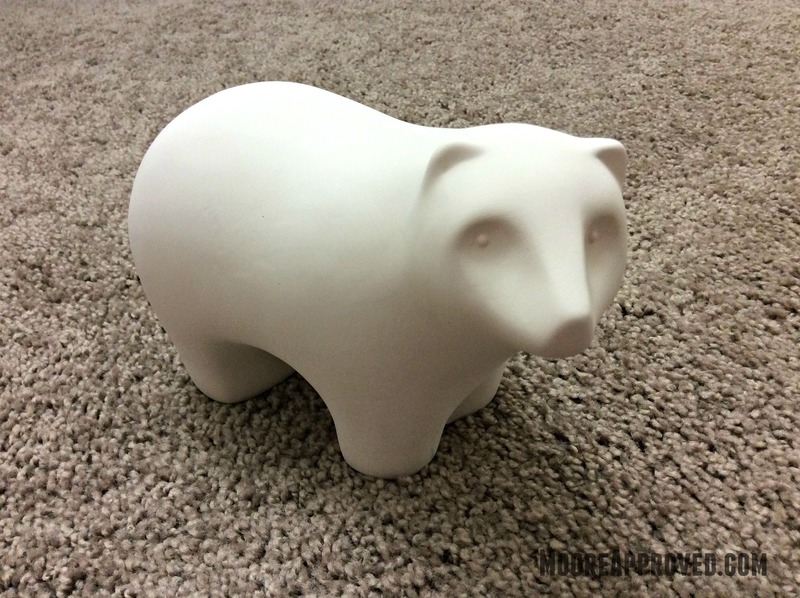 I did find this adorable porcelain bear for $3.99 and scooped that right up. The quality seems decent enough and it has a modern aesthetic. After perusing the selections for quite a while, I decided to take a chance on a few of the acrylic paints, a paint brush set, white chalk paint and clear wax. The synthetic paint brushes came with six medium/large sizes for $4.79. When I’d gotten everything home and up to the craft room, I tried to decide whether to paint the bear using the white chalk paint and wax, OR with the 20K gold acrylic paint. 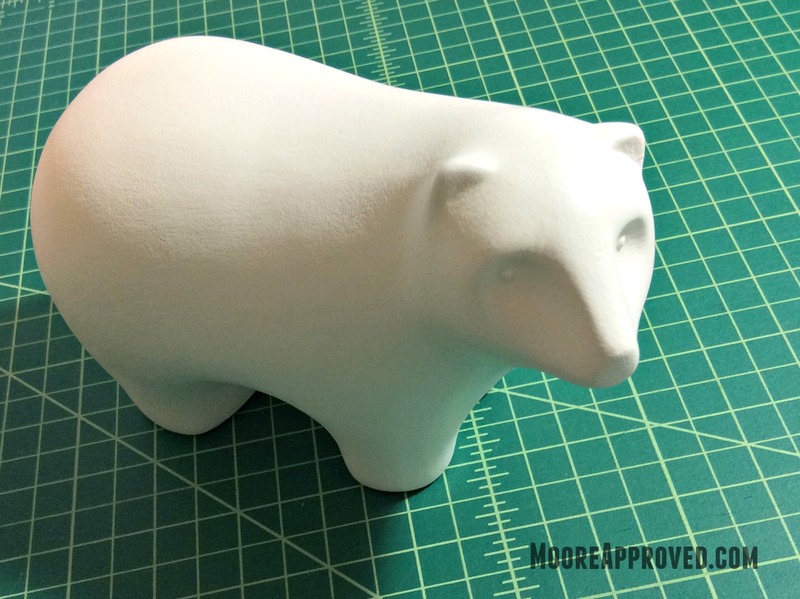 Because I wanted the bear to be a polar bear, I went with white. I followed the instructions for the chalk paint (it does say no priming necessary!) and the paint went on relatively smooth using one of the brushes in the set. There were some visible brush strokes, but nothing too traumatic. I let the paint dry for about an hour, then it felt dry enough to apply the wax. The instructions for the wax tell you to brush it on the painted surface, let it sit for one hour, then buff with a lint-free cloth. In my experience, I did not feel those directions worked well for me. I wanted to make sure I completely covered the entire surface, so in places the wax was applied thicker than other spots. Waiting an entire hour was far too long, in my opinion. At that point, I could not buff off the excess wax. The surface is also rather tacky – so lint, fuzz, hair, and whatever else is sticking to the figurine’s white finish. NOT GREAT! You may wonder why I decided to paint porcelain with chalk paint, but the label did say it could be used on a multitude of surfaces. I honestly think the finish would have been dramatically better had I only waited about five minutes before attempting to buff the wax. I think I will try the chalk paint/wax combination on a wood surface to see how it performs. To compare, I did brush some wax on a scrap piece of wood, and the finish is beautiful. In hindsight, I do think the gold acrylic paint would have performed better on the bear. So far, the only products I have been impressed with are the porcelain bear figurine and the paint brush set. The brushes do apply paint well, and they don’t look and feel cheap. Over the next few weeks I plan to test out the paints more and will post the progress right here on Moore Approved. All that being said, it is so exciting to see Target putting out a line of products encouraging its customers to actually MAKE things. The company has become known for trendy home and fashion items – now a driving force for the budget-minded consumer. 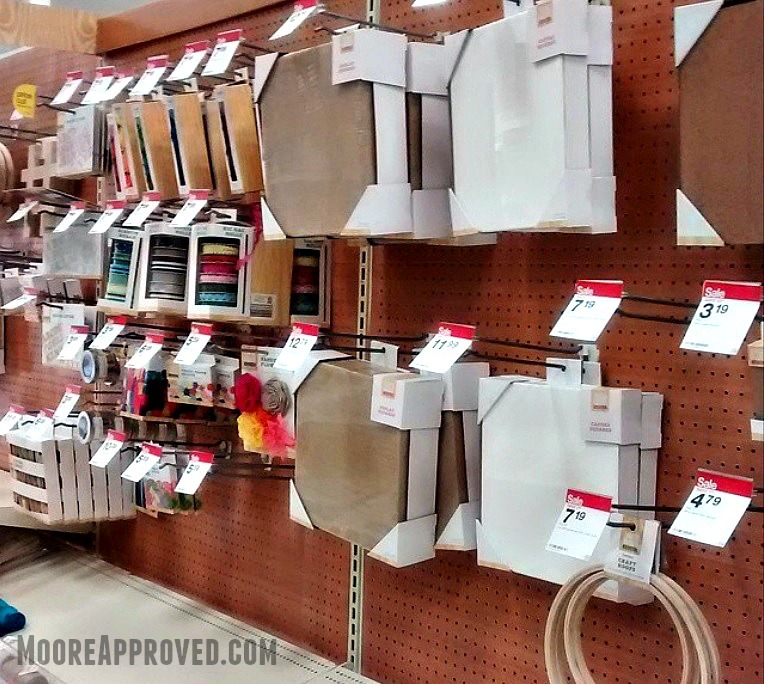 I’d love to see Target expand to carry more crafting supplies with its signature stylish flair. One Response to "Target’s New Hand Made Modern Line of Art & Craft Supplies"